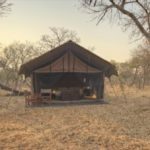 This nomadic tent shifts with the winds of the Okavango, setting its luxurious tents within the Chobe National Park, wherever Botswana’s wildlife choose to roam. The beauty of this lodging is that you will always be as close as possible to the animals of the Delta. 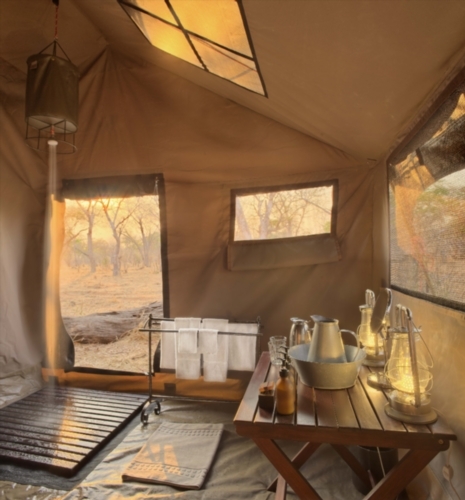 The genius of the mobile tents of Chobe Under Canvas is that there are few places that visitors can’t go on their stay. 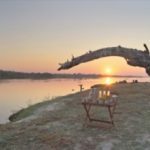 This unique adaptability makes Chobe Under Canvas a rare adventure. The private campsite sports a dining area, where guests share delicious cuisine together, and salas to unwind in. These canvas marvels are set up under the shade of indigenous trees for comfort and privacy. As night draws the vast spaces of the bush in, pull up a chair and revel in the crackling warmth of the campfire, where stories and memories are not only shared by created. 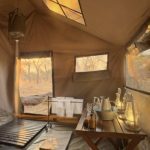 The 5 travelling canvas suites are fitted with en-suite bathrooms, where guests are guaranteed a steaming hot bucket shower and flushing water-closet. 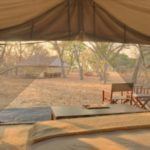 The decadent sheets of your comfortable double bed are only a sheet of canvas away from the chirping of the birds, the stamping of the elephants and the thundering roar of the lions. 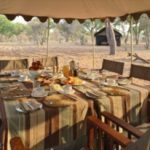 Each suite has a veranda, where you can indulge in the precious quiet of the bush and take in the tracks the wildlife have left the night before, as they travelled right past your tent. 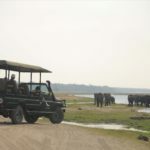 Acclaimed for its behemoth numbers, Chobe National Park’s elephants play an important role in their environment, thinning out the dense thickets of reed and papyrus along the banks of the River Chobe, creating space for the flora to breathe. 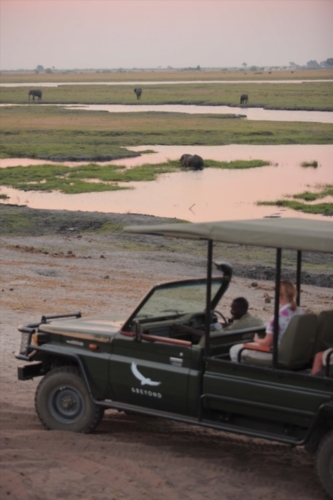 Follow these and other animals, of your choosing, on the twice-daily bush safaris. Here, experienced guides will fill you in on the lore of the wildlife, answering any burning questions about the land you may have. 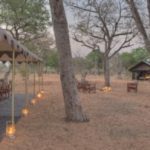 The mobility of the camp allows visitors a glimpse of the rarely seen puku and Chobe bushbuck. These herd animals are skittish at best and you’ll come to recognise their warning calls the second an unfamiliar scent reaches them. Within reach of these mammals you can be sure that a predator is never far behind, hunting them stealthily. 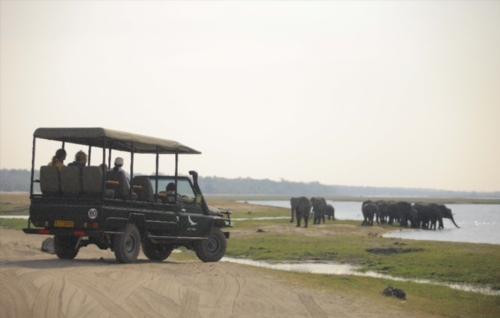 The Boat Cruises along the Chobe will glide you down the rivers. 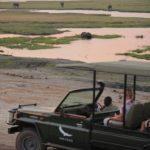 Here you’ll see the elephants, splayed-footed sitatunga, as well as roan and sable antelope who make use of the vast waterways. The Photographic Water Safari is a magnificent opportunity to try your hand at photography. Here you will sit in a chair, mounted with some of the latest camera technology. A professional photographer will guide you through the lore of this art, helping you to capture breath-taking moments to last a lifetime. 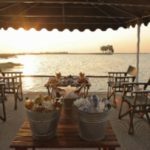 With all these offerings, Chobe Under Canvas will bring out the fearless, 19th century explorer that’s been living within you. The camp is set up to allow for ease of movement. Take a placid boat ride down the rivers. Guest areas are welcoming and open. Tents are fitted with everything you’ll need, including showers. Magnificent views from your bed. Have your sundowners by the water. Elephants conferring at the river. There’s no better way to get closer to nature.